The Sandusky Lee KDEW3012-05 is a steel wall cabinet with one adjustable shelf and a 150 lb. per shelf capacity suitable for the storage of items. This wall cabinet has two hinged doors with full-length stiffeners for strength and with a keyless electronic locking handle for security. The handle operates a two-point locking mechanism with two vertical rods that hold the top and bottom of the door shut for security. The keyless electronic lock has two programmable passwords, one for the administrator and one for the user and, for security, keeps records of when the unit was accessed. 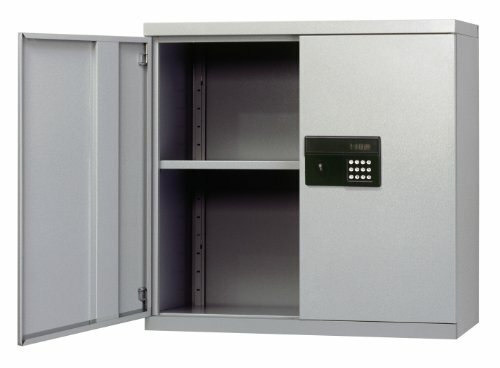 This wall cabinet comes with an external back-up battery to run the electronic keypad during a power failure and with two identical auxiliary bypass keys for use if electronic lock fails. The shelf in this cabinet can be adjusted in two inch increments to accommodate the height of stored items. The bottom surface on this wall cabinet is raised and can be used as a second shelf. This wall cabinet has a dove gray powder coat finish to resist chipping and corrosion. The assembled cabinet measures 30 x 30 x 12 inches (H x W x D). (H is height, the vertical distance from lowest to highest point; W is width, the horizontal distance from left to right; D is depth, the horizontal distance from front to back.) No assembly required. Cabinets are commonly used to store items to help create organized, efficient, and safe work areas. These systems typically consist of a frame with three walls that support adjustable or fixed-position shelves, one or two doors and handles. Added components may include locks for applications that require security and casters or wheels for applications that require mobility. Cabinets are used in a variety of office, industrial, educational, and residential settings. Sandusky Lee manufactures steel storage products for office, commercial, industrial, and educational applications. The company is headquartered in Littlestown, PA. I liked this cabinet The cabinet was structure was as described but the color which was such an off color, I had to repaint it to fit in an office setting. I guess a choice of prepainted colors would have made this a good choice of wall cabinet.